The second it gets cold, my kids want hot chocolate. Hot chocolate with marshmallows, of course. It doesn’t even get that cold here, but they want hot chocolate with marshmallows any chance they get! 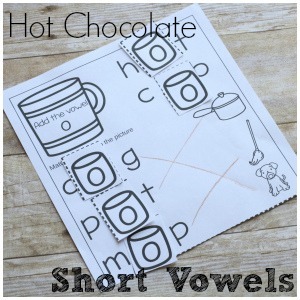 I thought it might be fun to do some hot chocolate themed learning, like hot chocolate short vowels! This is part of Cassie and my week of Winter printables! We are putting out winter printables every day this week! Most of them will be math or reading but of course I’m always up for a request or suggestion! For the most up to date information on free printables, the newsletter is your best bet. Every Thursday I pick a theme, send out a list of links for printables with that theme, and a subscriber freebie that you’ll get before everyone else! This is pretty much a no prep page, very simple. If your child can cut, just give them the page! They can cut out the marshmallows with the vowels on them. They put the vowels in the words and read them. There is a separate page for each vowel with different words on all the pages. I tried to keep it very simple for kids just starting to work on CVC words and sounding out short words. Every single word on the page is a real word for that vowel, so they shouldn’t encounter any pretend words! The bottom half has pictures to match the words up. The idea is just to draw a line between the words and the right picture. Very simple! When they’re done, they can color the mug and the pictures, if they want!